Interest in mechanisms of embryo implantation is increasing, particularly with the realization that failure of implantation after in vitro fertilization and embryo transfer places significant limits on the success of treatment. In addition, there is a need to provide hypotheses, and ultimately mechanisms, for the high rates of embryonic loss in women in the population at large. Traditionally, implantation research has concentrated on genetics and endocrinology without providing many therapeutic benefits. 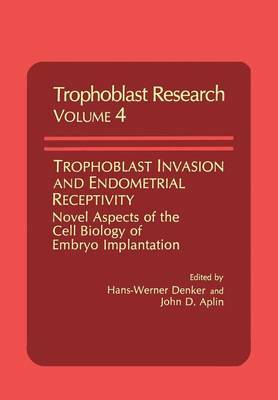 A new era is now beginning with the application of modem cellular and molecular approaches to the investigation of the relationship between trophoblast and endometrium. At the same time, older data can be reevaluated in the light of current research into cell- cell and cell-matrix interactions. The feeling that new avenues of research are open was apparent when an international group of scientists came together at a workshop on "The Cell Biology of Trophoblast Invasion In Vivo and In Vitro" held during the XXIV Annual Meeting of the Cell, Tissue and Organ Culture Study Group (C.T.O.C.) at Heidelberg in 1986. What was unusual about this Conference was the interdisciplinary dialogue between implantation researchers and tumor biologists, highlighting aspects common to invasion of trophoblast and tumor cells.